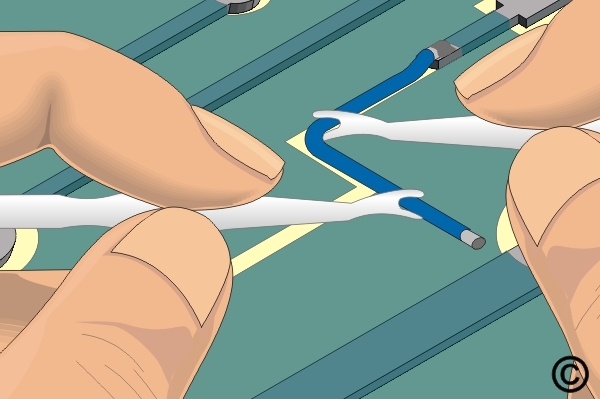 This method is used on circuit boards to replace damaged or missing circuits on the circuit board surface. 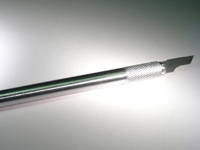 A length of standard insulated or non insulated wire is used to repair the damaged circuit. Lap solder the wire to one end of the circuit on the circuit board surface. Form wire using a Wire Guide. Form the final shape of the wire and solder in place. 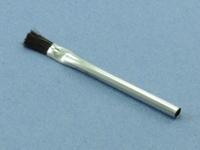 Bond the wires to the surface with adhesive or Wire Dots. Pre-cut polymer film tape with a high performance adhesive designed for tacking wires. 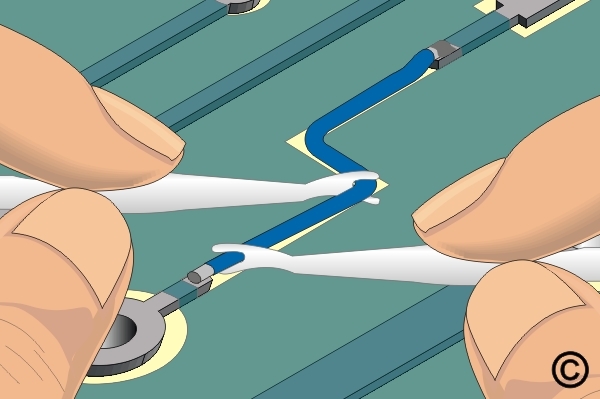 Figure 2: Lap solder the wire to one end of the circuit on the circuit board surface. 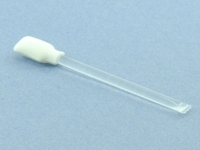 Figure 3: Form wire using a Wire Guide. Figure 4: Form the final shape of the wire and solder in place. 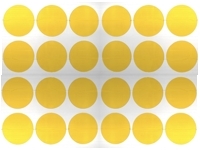 Figure 5: Bond the wires to the surface with adhesive or Wire Dots. Remove the damaged section of circuit using the knife. The damaged circuit should be trimmed back to a point where the circuit still has a good bond to the circuit board surface. Select a wire to match the width and thickness of the circuit to be replaced. Cut a length approximately as needed. See Table 1 for Solid Wire Equivalents. When using solid wire to repair a conductor, there should be no reduction in the cross sectional area. Strip the wire and tin the ends if needed. Non insulated wire may be used for short repairs if conductors are not crossed. 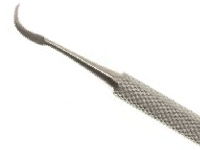 If the wire is long or has bends, one end may be soldered prior to forming the new shape. Place the wire in position. The wire should overlap the existing circuit a minimum of 2 times the circuit width. The wire may be held in place with High Temperature Tape tape during soldering. 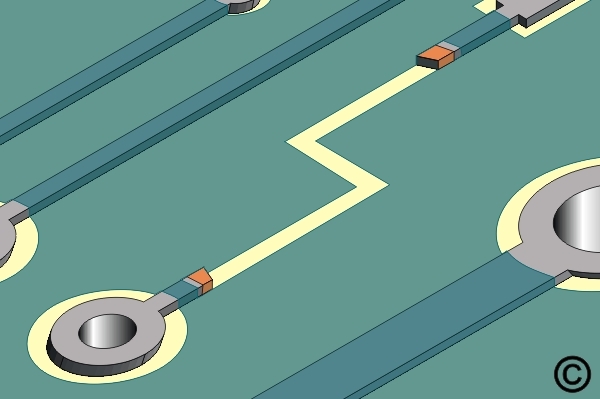 If the configuration permits, the overlap solder joint connection should be a minimum of 3.00 mm (0.125") from the related termination. 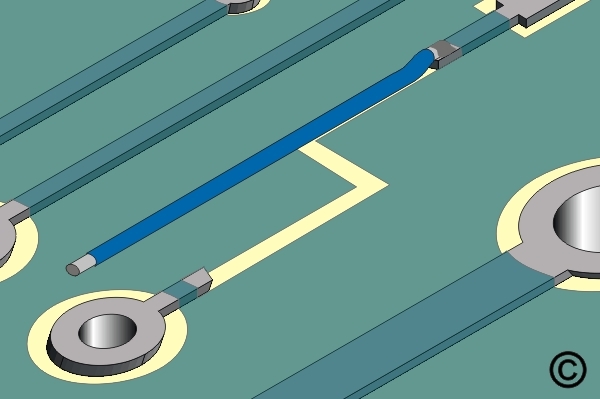 This gap will minimize the possibility of simultaneous reflow during soldering operations. 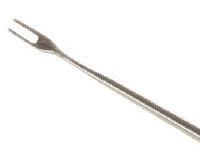 A Wire Guide Tool can be used to form the wire as needed. Remove any tape and clean the area. 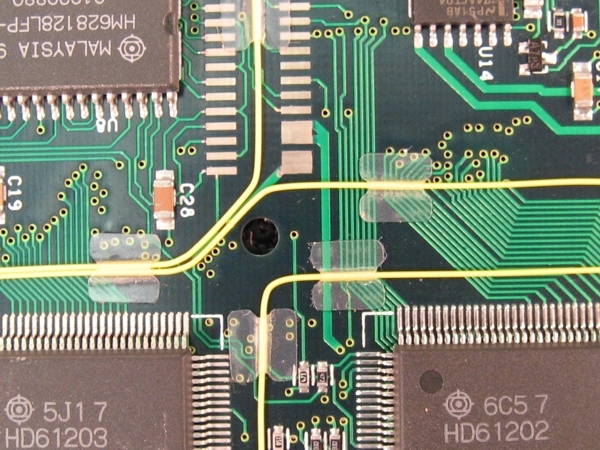 It may be necessary to encapsulate the solder joint connection if electrical spacing is reduced or the connection is beneath a component. 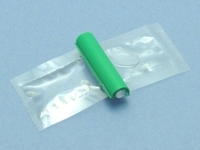 If desired bond the wire to the circuit board surface with adhesive, epoxy or Wire Dots. (See Figure 5) Refer to Procedure 6.1. After the epoxy has cured clean the area. Visual examination for alignment and overlap of wire.